I am Stefanie Ritzrow, 19 years old and just graduated from school this year. I have OI type IV and use a wheelchair as, I cannot walk. My biggest passion is traveling and I always wanted to combine that with being a helpful hand and experiencing more than a normal holiday. In December 2017 the framework of the “weltwärts everyone inclusive!” – a project for inclusive volunteer services -grabbed my attention. So I applied – first without any expectations. Then everything went really fast, I passed two preparational seminars where close friendships got build up and since 26th of September I live in Ho, Ghana, West Africa! 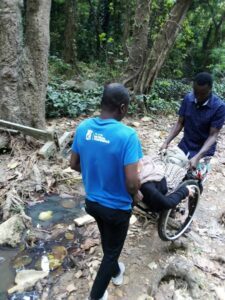 I am working for VOICE GHANA, an NGO managed for and by people with disabilities. 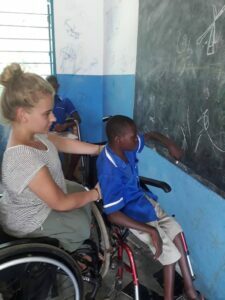 Voice Ghana’s focus is to promote access to quality education for children with disabilities. 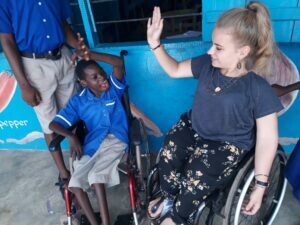 My placement is primarily in Ho Anglican School, Unit for Special Needs Children (mental retardation and psychological disabilities), where I assist the staff during the lessons and sometimes overtake a class about eight pupils for a short period to realize own ideas and projects. This school is a role model and very unique in this area. 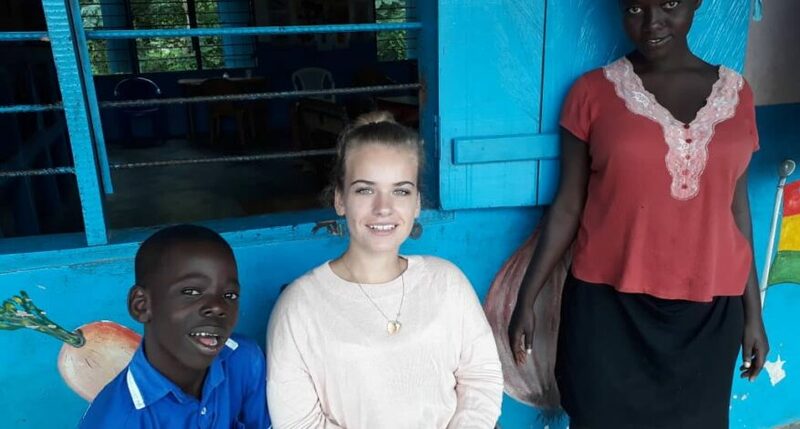 Together with my co-volunteer and two other short-term roommates, we are having a good time together and I am really enjoying my stay. Even though there are good and bad moments and sometimes I am full of worries, I always try to focus on how cool it actually is that I am here at all! Of course I also made some risky trips and had some dangerous situations, in the end it was at least fine and I could laugh about what I just set myself to do again! Unfortunately I am pretty dependent here… I often have to get carried, pushed or assisted. However this is still not a big problem for me, as I have a private taxi driver, an assistance for household and I am never really alone anyway. I also have physiotherapy here, twice a week. 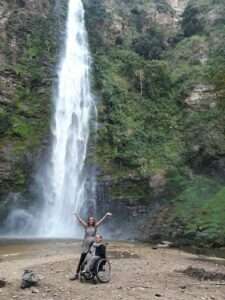 Apart from the volunteering work, my biggest highlights so far, were the Wli Waterfalls in a mountain-like tropical forest, coming from Togo (for a couple of minutes my nerves lost control and I thought I could never make it since I was scared to literally fall down the mountains), a traditional Ewe-Festival in a beautiful forest located 10m below street level without any chance to get down (and up) there with a wheelchair. But I made it! Together with German and local friends we had a really fantastic day and night. Apart from that, I had my first trotro ride as well, where I can only advise to be careful with OI! Moreover, you should not take a tuctuc bike for long distances if you are with more than five people AND have a non-foldable wheelchair. Haha. At first, a lot of things were new for me and I probably had a little „culture shock“, but if you really open your eyes and observe, ask questions, be sensitive for potential backgrounds and meanings you might not understand right from the start, you will surely have a great time and take part in a personal and global movement. I always knew that neither my wheelchair nor my OI could discourage me from doing so. Volunteering is not only spending time in a country “far away“ and being a saviour in a protectory or nursing home. It is rather about changing your perspective, exchanging cultural aspects, ways of life, thoughts, opinions, and so much more. Then when you go back to your home country with all your new experiences, you will also bring something back home to share. So what I think is, that the connection that gets build up is full of profit for everyone. 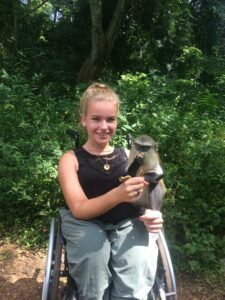 Especially people with disabilities should be taken into development cooperation more.